Also an adopted son of King Tu Duc, King Dong Khanh was sworn to throne by the French colonists. 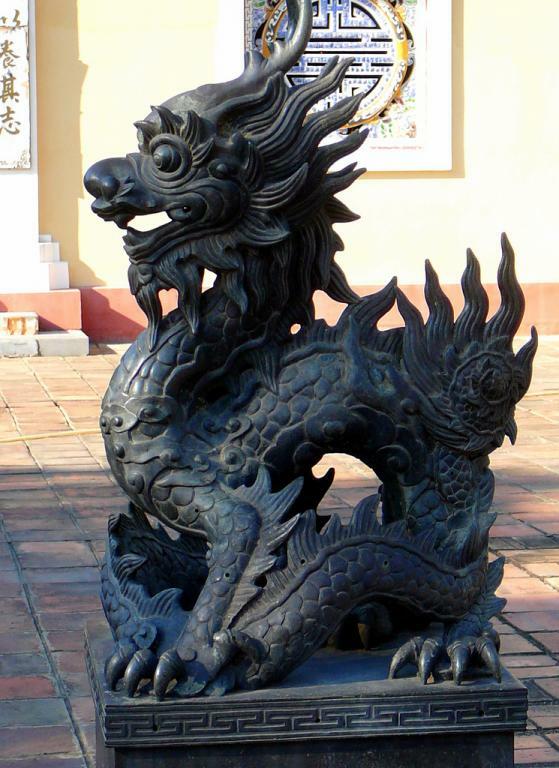 After being crowned, he ordered to build a temple called Truy Tu Temple inside the tomb of his father – Kien Thai Vuong. Since he didn’t expect himself to pass away at the age of 25 (3 years after taking power), he did not plan for his tomb. When King Thanh Thai continued the kingship, the country was at an unstable phase of development thus King Dong Khanh also was worshipped in Truy Tu Temple, which was then renamed as Ngung Hy Temple. His corpse was buried simply on a hill named "Ho Thuan Son", 30m to the west of Ngung Hy Temple. The whole tomb area was called Tu Lang. The building process had to be halted many times and most of the construction work was only completed under the reign of Khai Dinh – Dong Khanh’s son, in 1917. Hence the fact that the tomb was built in 1888, before the death of the Emperor in the year 1889. 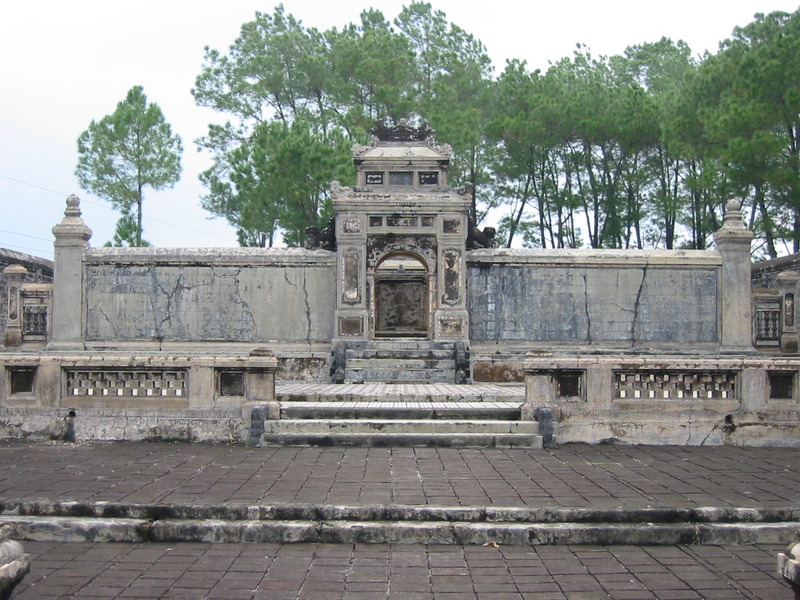 The imperial tomb of Dong Khanh is smallest Imperial tomb of Hue, with French influences and terracotta sculptures. This place was actually was a temple in memory of the Emperor's father, but was reused as a grave due to the sudden death of the Emperor in the year 1889. The complicated history of building resulted in a mix of influence in this monument’s architecture. 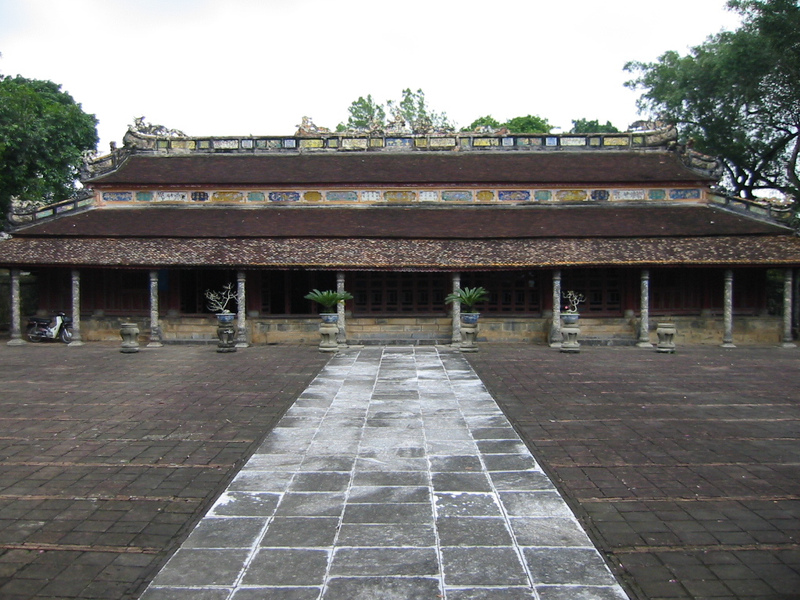 One of the most notable sites in the complex is Ngung Hy Temple - a twin mansion typical of Hue Citadel but backed by a third house, which makes it into a triplet complex. The temple is well-equipped with typical royal furniture and calligraphy. The grounds of the Imperial Dong Khanh tomb is composed of 20 buildings, oriented towards the Southeast and very near each other. The courtyard of ceremonies is decorated by terracotta statues covered by cement, unlike in the rest of imperial tombs, which are made of stone. What more detacable Imperial Dong Khanh tomb is the Temple Ngung Hy, traditional temple decorated in shades of gold and red, where we can appreciate the mixture of cultures and French influences on a more traditional Vietnam. Besides the traditional aspects, Ngung Hy also opened up to a new era of arts inspired by both Western and Eastern traits. These influences are patent primarily on the rooftops. The roofs are decorated with terracotta statues representing fishermen, floral motifs, etc. This is the only imperial Tomb that has this kind of decoration. Remarkably, there were 24 drawings illustrating the Chinese story named “Nhi thap tu hieu” - 24 examples of filial sons and daughters. 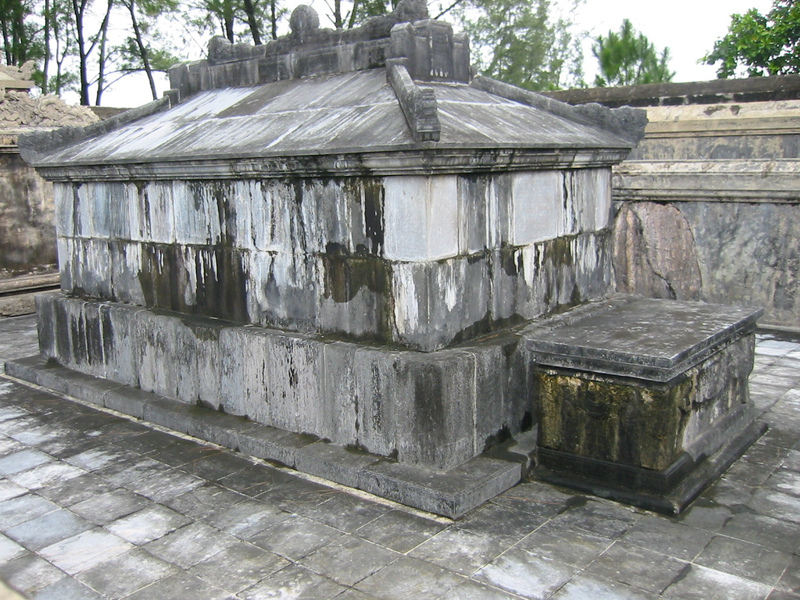 The sarcophagus of Emperor Dong Khang is located next to the temple Ngung Hy, 30 metres. 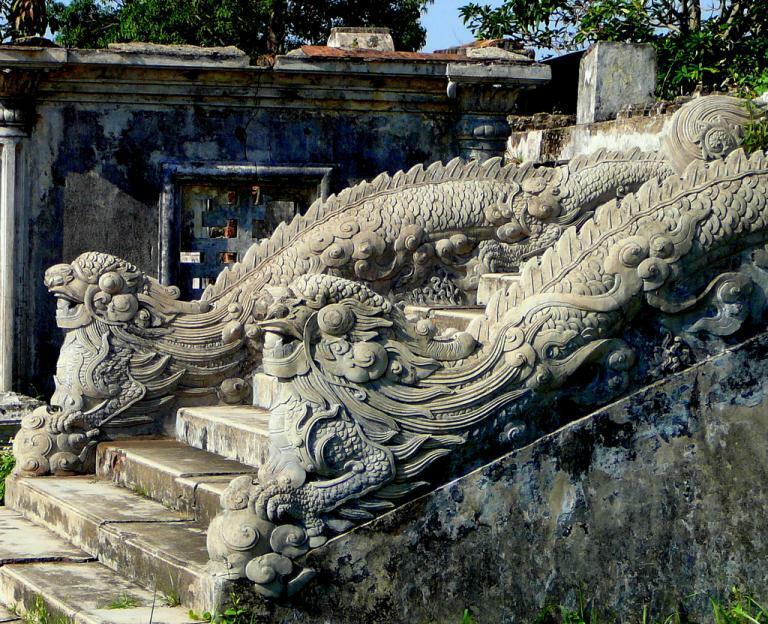 This tomb is peculiar because instead of following the Chinese architectural style, the Tomb remains Roman cannons. 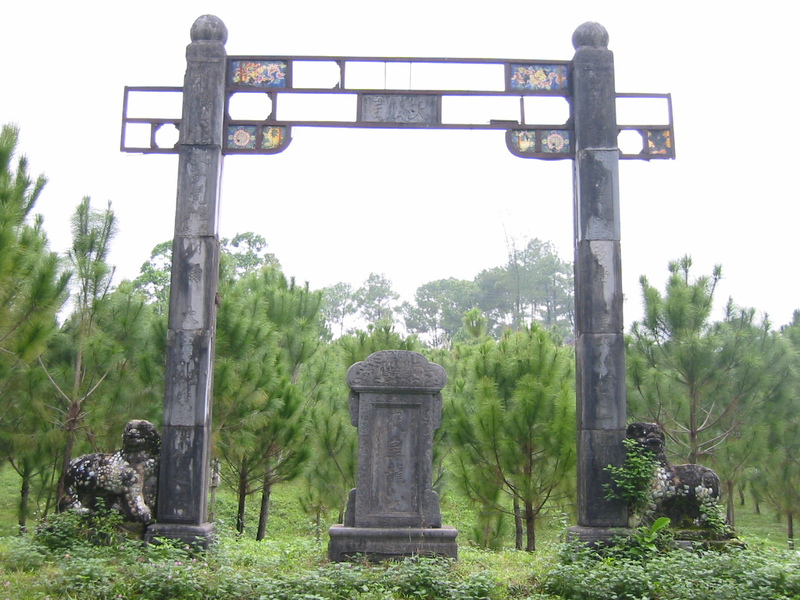 The tomb of Dong Khanh is open daily from 7: 00 to 11: 30 and 13: 30 to 17: 30 hours. Due to the poor state of conservation and restoration work, many parts of the imperial tomb are closed to the public. 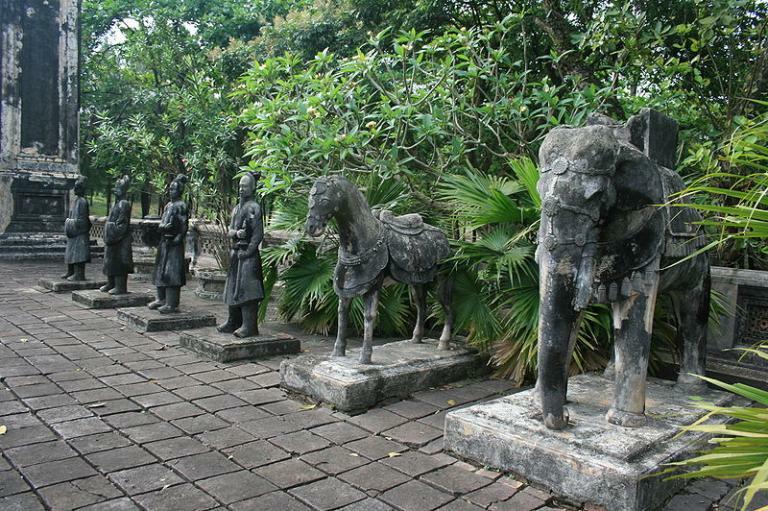 It’s about 200m from Tu Duc Tomb, 6 kilometres southwest of the city of Hue, and tourists can get there easily by bike, taxi or motorbike. The most recommended is to drive, but you can also go to the imperial tomb Dong Khang browsing the Perfume River by boat, moor at the pier where Ben Than to arrive walking to the Imperial Tomb. Entrance to the Imperial Tomb Dong Khanh has a symbolic price of 22,000 VND (less than 1€ , see Vietnam currency).